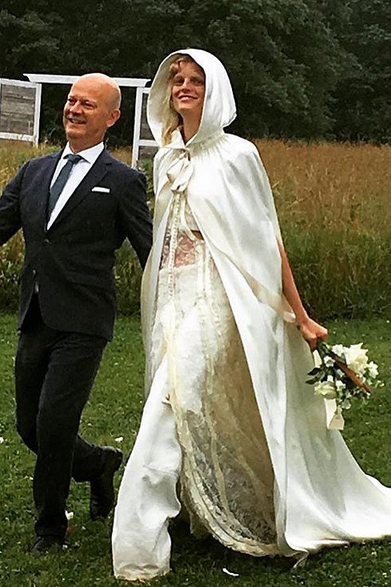 Belgian model Hanne Gaby Odiele married her long term boyfriend, DJ and Acne contributor, John Swiatek this weekend in an alternative wedding that anyone who’s ever dreamed of bucking tradition and getting hitched in a field/on a beach/atop a mountain will love. 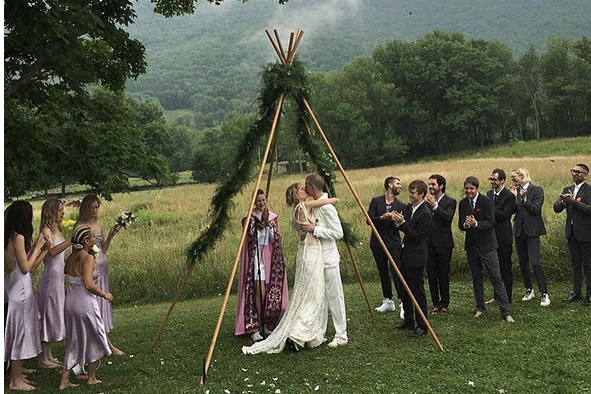 The happy couple wed in a remote forest, in upstate New York, exchanging their vows beneath a simple wooden teepee. Naturally, being an Alexander Wang muse (most recently she, her now-husband, and her model BFF and bridesmaid Anna Ewers starred in the designer’s spring 2016 campaign) comes with the obvious perk of access to bespoke designs. Hanne’s designer pal hooked her up with a one-of-a-kind Balenciaga piece (he was previously creative director of the French mega-brand). So how did it look? Well, instead of a classic dress, Hanne opted for a cool, off-white hooded cape with a lace top and overlay and wide-leg trousers. It was all very Game of Thrones meets Glastonbury; anyone who runs a mile at the thoughts of a frothy wedding gown take note. The bridesmaids were a little more traditional – they wore lilac slip dresses at varying lengths. As well as Anna Ewers, Hanne’s bridal entourage included other models Jacquelyn Jablonski, Alana Zimmerman and Kasia Struss, making for one stunning wedding album. Meanwhile, the groomsmen wore classic suits with trainers and Kurt Cobain-style sunglasses. The hen do was just as unique, you may have spotted her and her model squad on Instagram wearing personalised Juicy Couture tracksuits (don’t wanna say ‘we told you so’, but we did herald it’s revival a few weeks back). So does this sound like the dream bohemian wedding to you? Let us know what you think by tweeting us @marieclaireuk.